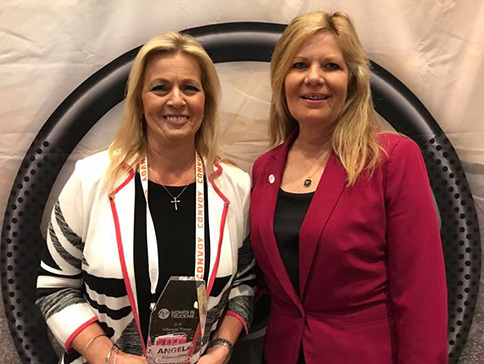 Dallas, TX (November 13, 2018) — Freightliner Trucks and the Women In Trucking Association (WIT) presented the eighth annual Influential Woman in Trucking award to Angela Eliacostas, Founder and CEO, AGT Global Logistics. The winner was announced during the panel discussion of “Hard-Won Lessons from Trailblazing Women” at the WIT Accelerate! Conference & Expo in Dallas, TX. The panel was facilitated by Joann Lublin, a Pulitzer-prize winner and news editor for The Wall Street Journal. Eliacostas was presented the award by Kary Schaefer, General Manager, Product Marketing and Strategy, Daimler. The Influential Woman in Trucking award recognizes women in the trucking industry who make or influence key decisions, have a proven record of responsibility, and mentor and serve as a role model to other women. The award was developed in 2010 as a way to honor female leaders in trucking, and to attract and advance women within the industry. With more than 30 years in transportation, Eliacostas has worked her way from the ground up. Following generations of relatives with expertise in the transportation industry, she made the natural transition to her own career by learning the processes at trucking companies to running third-party logistics. In 2005, Eliacostas formed All Girls Transportation and Logistics, Inc. As offerings and services grew, a name change was required to fit their expansion and AGT Global Logistics was born. The company, headquartered in Glen Ellyn, Ill., provides a broad range of third-party logistics (3PL) services. In addition to raising four boys, and now being an active loving grandmother, Eliacostas has been recognized for making AGT Global Logistics one of the top 50 in Illinois and top 1000 woman-owned businesses in the United States. Eliacostas’ father once told her that as a woman in the industry, she would face many challenges, but hard work knows no gender. “These are words to live by and I'm honored to help encourage and hopefully inspire women in the world of trucking,” she said. The finalists of the 2018 Influential Woman in Trucking award also included Nozuko Mayeza, Managing Director, Tulsawiz Logistics and Brooke Willey, Vice President – Human Resources, CRST International. Women In Trucking Association, Inc.
Women In Trucking is a nonprofit association established to encourage the employment of women in the trucking industry, promote their accomplishments and minimize obstacles faced by women working in the trucking industry. Membership is not limited to women, as 17 percent of its members are men who support the mission. Women In Trucking is supported by its members and the generosity of Gold Level Partners: Michelin North America, Arrow Truck Sales, Bendix Commercial Vehicle Systems, Daimler Trucks North America, BMO Transportation Finance, Expediter Services, Great Dane, J.B. Hunt Transport, and Walmart. Follow WIT on Twitter, Facebook, or LinkedIn. For more information, visit http://www.womenintrucking.org or call 888-464-9482. Freightliner Trucks is a division of Daimler Trucks North America LLC, headquartered in Portland, Oregon, and is the leading heavy-duty truck manufacturer in North America. Daimler Trucks North America produces and markets Class 4-8 trucks and is a Daimler company, the world’s leading commercial vehicle manufacturer. For more information, or to locate the Freightliner Trucks dealer nearest you, visit https://freightliner.com.